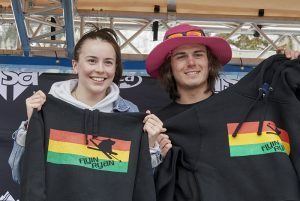 On April 15, Karina Jorgensen-Fullam from the Whistler Freeride Club and Josh Gold of Squaw Valley Freestyle were each presented with Flyin Ryan Awards. Representing the Flyin Ryan Hawks Foundation was Bryan Salatino, Flyin Ryan Coach and author of the Flyin Ryan Decisions Program for Teams. The Flyin Ryan Awards are presented to the male and female athletes who best demonstrated the positive attitude, camaraderie, and genuine love for the sport of Freeride skiing and snowboarding that were exemplified by Ryan Hawks. Head coaches from programs across North America were tasked to observe athletes in the start and finish area during the event and note the athletes who stood out above the others. After a week of non-stop action at Snowbird, the names and stories are reviewed, and Karina and Josh were selected as the Flyin Ryan Award recipients.